I recently visited one of my favorite Phoenix area food trucks, Short Leash Hot Dogs, at their brick and mortar location, Sit…Stay. If you are ever in the Phoenix area you must check them out. They have a variety of locally made weiners and toppings that they serve on the softest naan bread you will ever eat. Their most interesting concoction, Bear, has peanut butter, Cracker Jacks, smoked Gouda, bacon and BBQ Sauce. It is a must try! 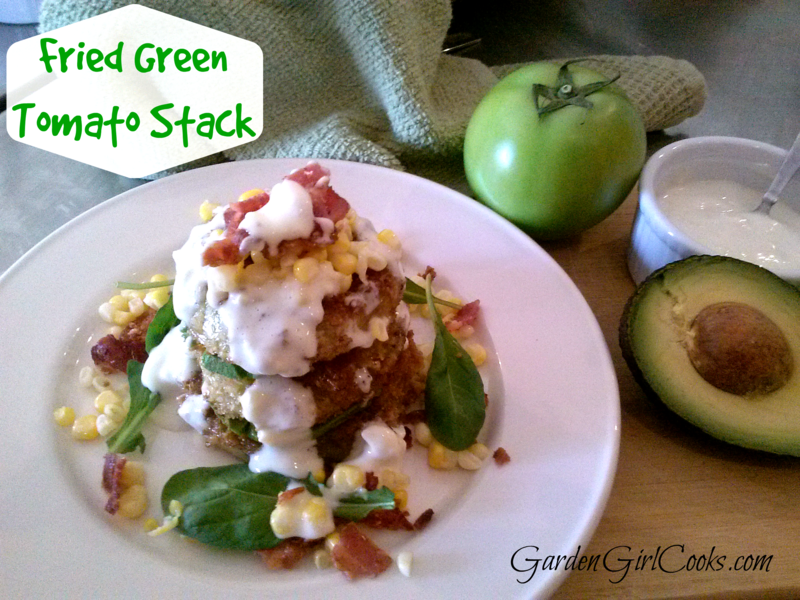 I was excited to see that their restaurant had quite a few extra menu items including this Fried Green Tomato Stack. I love fried green tomatoes and I don’t see them on many menus so I had to try it. It was amazing… so much so that I decided to visit my local farmer’s market the following day in search of green tomatoes. I was so excited to find some, along with some fresh Arizona corn. 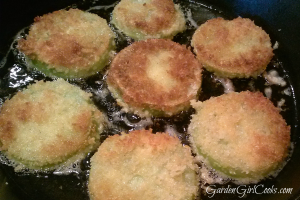 Slice tomatoes about 1/4 inch thick, dredge in flour, egg, then panko flakes or bread crumbs. Fry over medium heat on each side until golden brown. Drain on cooling rack or paper towel. Sprinkle with salt to taste. Layer avocado slices between each tomato and top with corn, bacon and arugula. 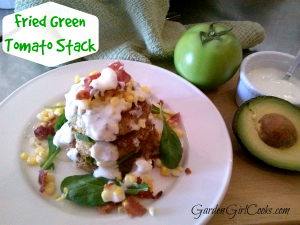 Serve with your favorite blue cheese dressing.